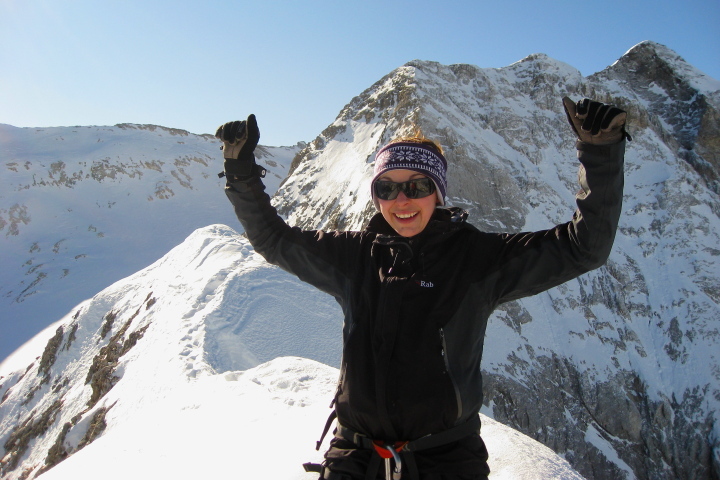 This is a great fun, comprehensive and great value expedition and winter skills training course for women. 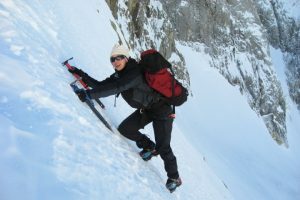 It’s a fantastic opportunity for the enthusastic female adventurer to learn the necessary techniques to safely explore the mountain environment in winter conditions. As with all our women-specific adventure weeks, this one promises to be great fun and highly supportive. 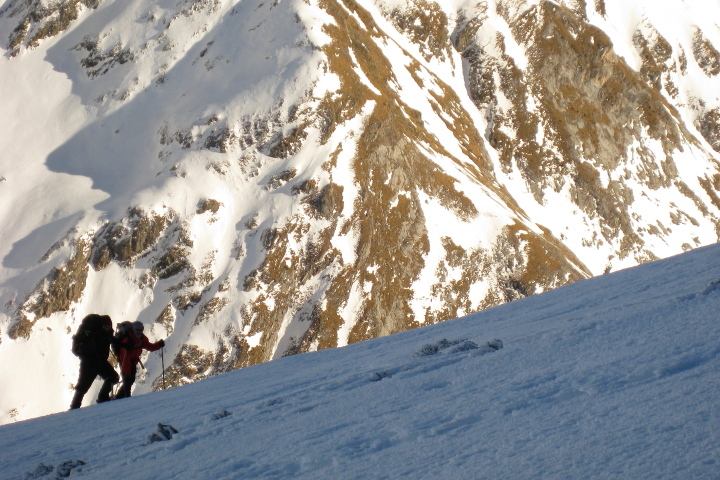 Your instructor and guide is highly experienced with numerous expeditions to the 8000m peaks under his belt. 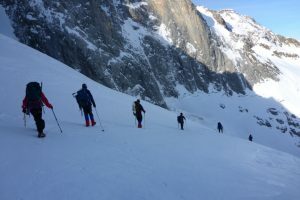 The mountains of the central Pyrenees are an ideal environment in which to learn how to use snowshoes, crampons, ice axes, build snow holes as well as how to move safely in the mountains. You’ll learn a whole bunch of confidence-building skills that will increase your understanding of the mountain environment in winter. If you have a reasonable level of cardio-vascular fitness and good general strength then you’ll get the most out of this women’s winter skills course. The week is entirely self-supported. You’ll be carrying all your own equipment which will include technical kit as well as everything you’ll need for sleeping in the mountain refuges. You can expect long days in the mountains in possibly tough conditions as you learn winter skills that will build your confidence for other high mountain adventures. As you’ll appreciate, nobody can guarantee the weather in the mountains. It may be necessary to adapt the itinerary if the weather means the training course cannot be carried out safely. It’s therefore vital that you are prepared to be flexible. The final choice of accommodation for the mountain days will depend on conditions and the weather forecast. 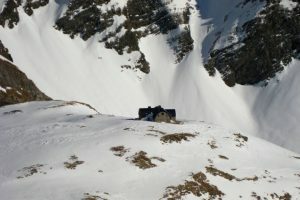 You can expect to be either in the unmanned winter quarters of a refuge or in one of the manned refuges that have rather more comfortable facilities. If the latter then there’ll be an additional charge of €60 for 3 nights accommodation. This outline itinerary is Plan A. It may need to change depending on weather conditions at the time. 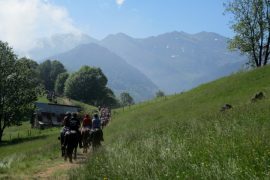 The transfer from Toulouse airport to your guest house near Bagneres de Luchon is just 1h30. If you all arrive in good time you may have time for a quick rock climbing session with your guide to familiarise yourself with rope techniques. Later, you’ll have an evening briefing which will cover all the essential information that you’ll need for the following days. There’ll also be talks on food, personal equipment and group equipment as well as weather forecasting. Useful stuff! Your guide will transfer you to the starting point for your training course which will be chosen depending on the weather conditions and forecast at the time. This area will always be spectacular and could be the Hospice de France, Valle de Benasque or the Vignemale areas. 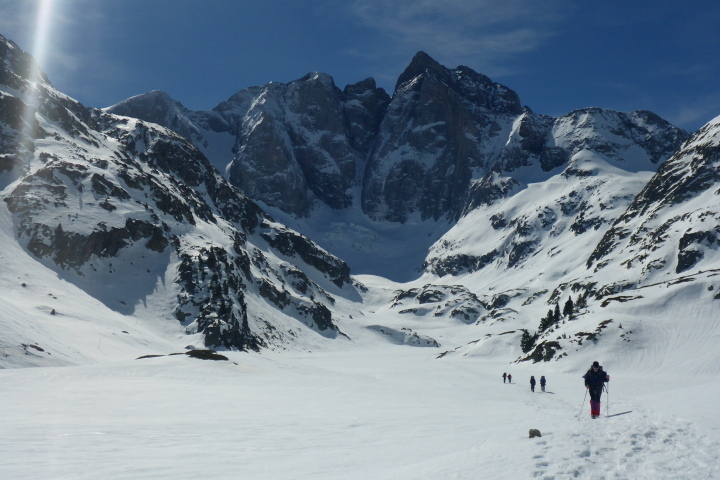 Today we will concentrate on learning the art of snow-shoeing and snow safety in which we’ll get an understanding about varying snow conditions and avalanche risk assessment. Your destination for the night will be the winter quarters of an unmanned refuge up in the mountains. You’ll all pitch in to make brews and prepare dinner with the food that you have brought up with you. Dinner is sure to be accompanied by plenty of banter before you retire to your sleeping bags for a good night’s sleep. Today, the focus is on learning and developing mountain skills. 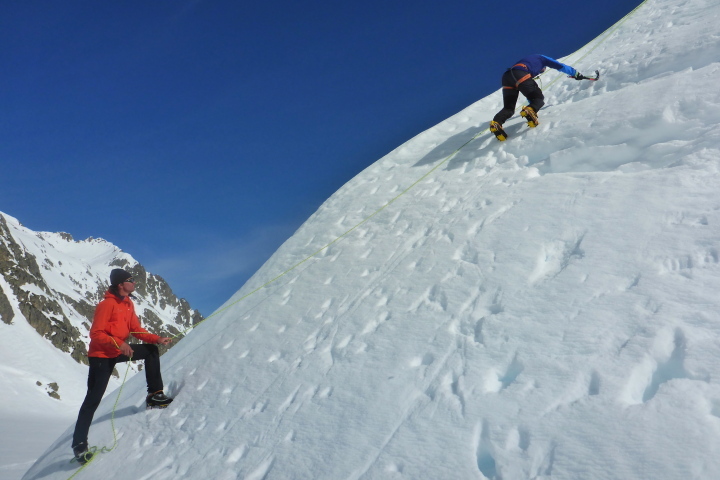 These will include ice axe self-arrest, ice axe and crampon work on varying terrain and conditions, building snow and ice anchors and belays, moving together over snow and ice, crevasse rescue, the construction of snow holes and weather forecasting. 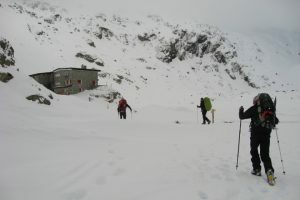 After your days exertions you’ll either return to the mountain hut for the night or construct a snow-hole if conditions allow. 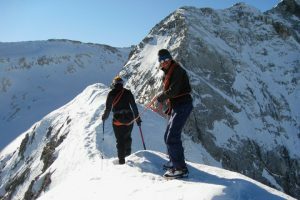 Today we begin to consolidate our freshly learned mountain skills by using them to ascend a small peak. You will be closely supervised by your instructors but the focus will be on your own decision-making processes. 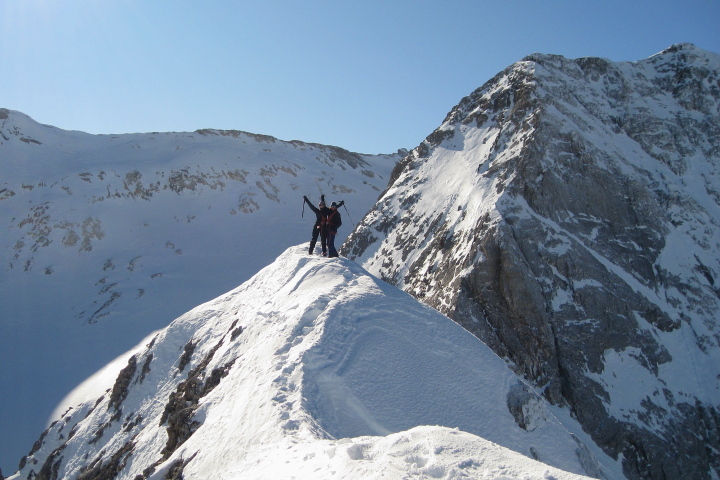 A summit attempt on the Vignemale (highest peak of the French Pyrenees. 3,298m) or Pico de Aneto (3,404m) is a typical objective chosen for the second day of this period. 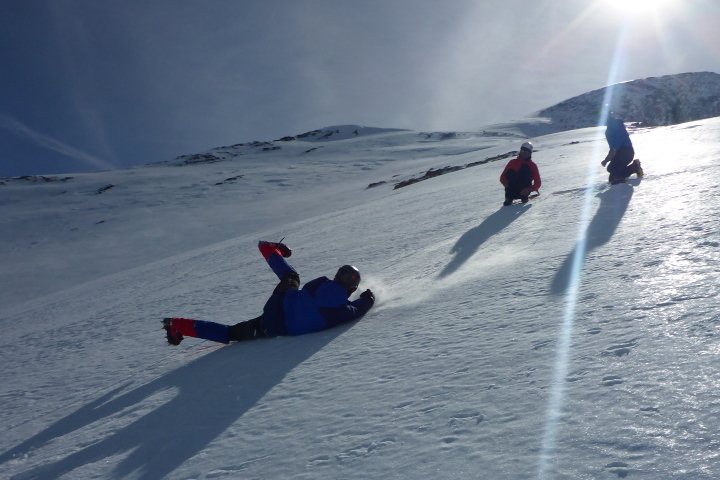 Both are graded PD in winter conditions. 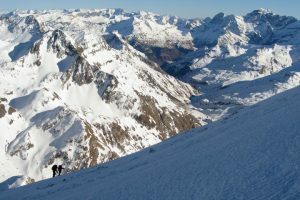 (Alpine grading on the French Alpine scale). 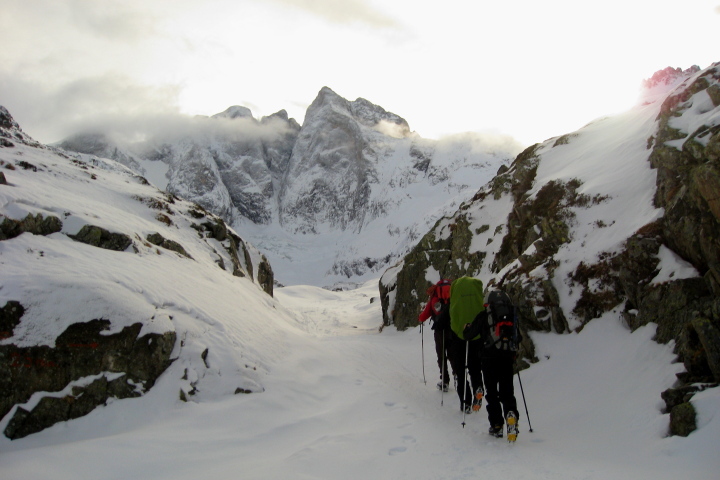 You will spend these final 2 nights in a mountain refuge or a snow-hole. 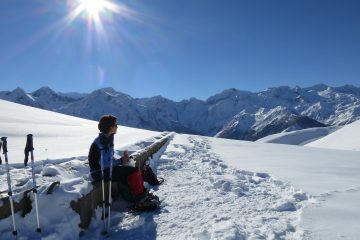 Today you’ll descend from the mountains today with either crampons or snowshoes on your feet, learning skills as you go. 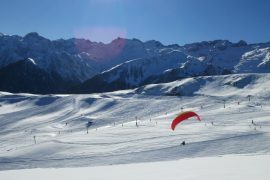 After the transfer back to your guest house in Luchon you’ll have further consolidation of the skills you’ve learnt and a de-brief of the programme. 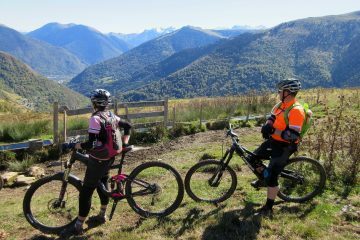 In the evening it’s time for a proper chill out and a few beers with your celebratory meal in Luchon. You’ve earned it after all! 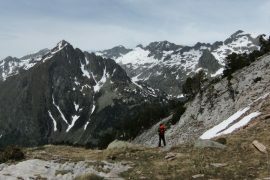 A sad today today as it’s the day you leave the Pyrenees mountains. You’ll no doubt be tired but with a head full of enthusiasm for more winter adventures following your mountaineering course.